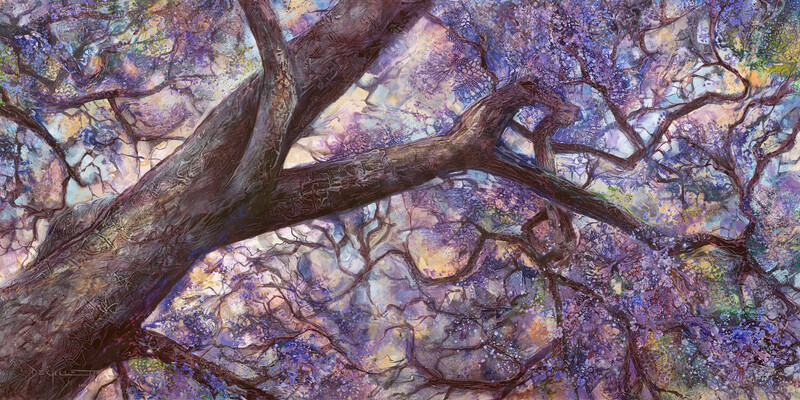 Symbol of my childhood, a stately Jacaranda tree sways in full flower, seen from the scintillant shadows dappled below. Growing up in Grafton, NSW, Australia, a town known for its roadside plantings of Jacaranda trees and the annual Jacaranda festival, these trees and the colour Jacaranda purple are really resonant with me. I spent much of my childhood under these trees, reading endlessly, surrounded with their delicate fragrance as the fragile blossoms drifted down. This highly textured painting is composed of many, many layers, with the top layer being a fragile, translucent covering of tinted inks.